Cult or crap? All a matter of opinion, but the Teenage Mutant Ninja Turtles have a very real following, and their fandom includes adults who would probably rather you didn't know about their secret shame. They are also of interest for upsetting the British censor, prompting an initial name change (this was dropped by teh time the first live-action film arrived) to Teenage Mutant Hero Turtles (ninjas were thought of as just too violent) and the enlargement of frames and the cutting of scenes in the first film to remove any trace of Michaelangelo's chain sticks. Now all three films have been collected together in one DVD package and, for the first time in the UK, on Blu-ray as well. Get 'em while they're hot, before Michael Bay's doubtless horrible $125 million reboot arrives next year. Hooray for Hollywood. For years Michaelangelo, Leonardo, Donatello and Raphael have lived deep in the sewers of New York, learning the art of Ninja from their master, Splinter. But when a massive crime wave sweeps the city, the man8sized, pizza eating TeenageMutant Ninja Turtles join forces with reporter April O'Neil and vigilante Casey Jones to combat the corrupt gang of criminals and their mysterious leader...the evil Shredder. The turtles are up to their shells in trouble when a canister of toxic ooze falls into the hands of the evil master Shredder. Aided by their new pal Keno, the pizza delivery boy, the turtles take on the Shredder and his mutant allies, Rahzar and Tokka, to capture and destroy the dangerous ooze and make the world safe for Turtles, humans and pizza. When April O'Neil buys what she thinks is a harmless Japanese antique its magical powers are revealed when she is thrust back in time 400 years to 17th century Japan and into the hands of an evil Emperor. Our turtley awesome heroes only have days to travel back in time, defeat ancient warriors, rescue April and somehow make it back home while the pizza's still hot. 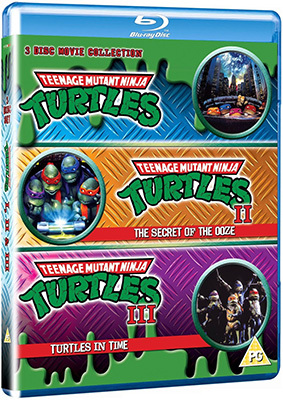 The Teenage Mutant Ninja Turtles Movie Collection will be released on 3-disc UK DVD and Blu-ray on 28th October 2013 by Medium Rare Entertainment at a very reasonable RRP of £14.99 for the DVD and a pricier £24.99 for the Blu-ray.